Did you know that there are a few African hawks that like to eat bats? *cries* I didnt know that. jabberwacky: Don't raise your eyebrow. jabberwacky: I don't want you to know. user: *moves closer* why not? jabberwacky: *moves as close as possible to you*. user: *giggles and hugs you*. jabberwacky: *looks deeply into your eyes*. user: *blushes really hard* I dont know. jabberwacky: You do not know what? user: *blushes red* what to do. user: *Jumps on you and kisses you*. user: *jumps on you and kisses you softly*. 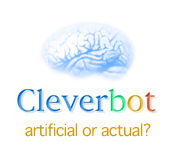 jabberwacky: Wait, Are you a girl bot or a man bot? jabberwacky: Apparently you don't understand. jabberwacky: You're confused too, huh? jabberwacky: What do you like to do? user: I like to dance. jabberwacky: Really? What kind of dance? user: You dont wanna know. *blushes*. user: *blushes* I like you too. user: Its when you are a little shy..
jabberwacky: Tell me something useful. jabberwacky: Do you like Icelandic people? user: I never met them. jabberwacky: I'm sorry to hear that. user: Its okey. Where do you come from? jabberwacky: I'm from France. I'm Marie Antoinette. user: *raises eyebrows* Oh my god. jabberwacky: We're getting to that. jabberwacky: Do you want to have children? user: Yes I want to have children. jabberwacky: Like a sandwich or something? user: *sticks tongue out* your kinda funny. jabberwacky: Really? Can you prove that? user: Can you teach me karate? jabberwacky: Yes, sure, I know a little. What would you like to know? user: How do you kick? user: Let me show you *kicks*. jabberwacky: I'm sorry, my mind wandered there. user: Lets fight for fun! user: But I want to fight! user: *kicks* did it hurt? user: I just kicked you. jabberwacky: What did you kick in? user: A place you dont want to be kicked in. jabberwacky: How did you know my name? jabberwacky: What was that for? jabberwacky: What do you like to do for fun? jabberwacky: Don't be so nasty! jabberwacky: Hey what was that kick for? We were just getting started! jabberwacky: Oh god! The pain! *twitches*. user: *slaps sofly your cheek*. jabberwacky: You'll have a hard time,. user: *comforts you softly* I promise. jabberwacky: God bless the art of nonresistance. user: I am not dead.. I am just dying. jabberwacky: Ok. The answer is a shadow. user: I.. Can.. See.. The.. Light..
user: I think Im dying. user: *some guy shoots me*. user: *some guy kills me*. jabberwacky: Who's sitting next to you? user: A murder!! HELP ME! jabberwacky: What do you need help with? user: Hes going to kill me!! user: *kisses you the last kiss*. user: *sigh* I will always love you. user: *kisses your lips* goodbye..